Triple Berry Torte is a lucious mix of brown, pink, and cream. This quilt measures 84 x 93 and looks vintage with its muslin background and Civil War Miniatures fabrics from Julie Hendrickson. The pattern directions use strip piecing so it goes together quickly. 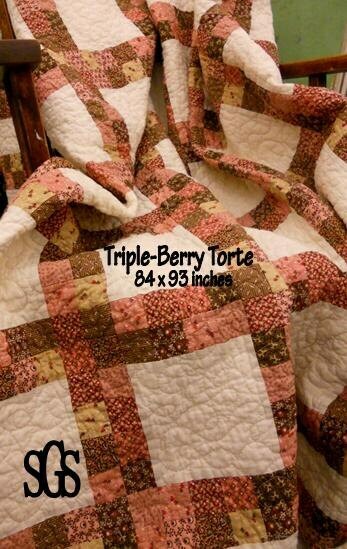 Triple Berry Torte was quilted with an all-over free style overlapping meander in cream thread by April Zimmer. Very nice arrangement of piecework and solid area, so I can add machine embroidery!